With the young Speed Turn already turning 2.0, we officially say goodbye to the Dynafit 5-hole toe pattern. This new iteration of the Speed turn features a simpler toe piece modeled after the Radical toes. With an elongated mounting pattern and forged aluminum and steel construction, the toe is stable and durable. While it is missing the Power Tower step-in guides from the Radical series, the toe promises to be equally rugged. The heel piece is the Classic hand-turner, with reliable stops for each of the riser heights and ski mode. The binding has fully adjustable lateral and vertical release functions, as well as an uphill lock. The Speed Turn 2.0 is the newest quintessential Dynafit binding. 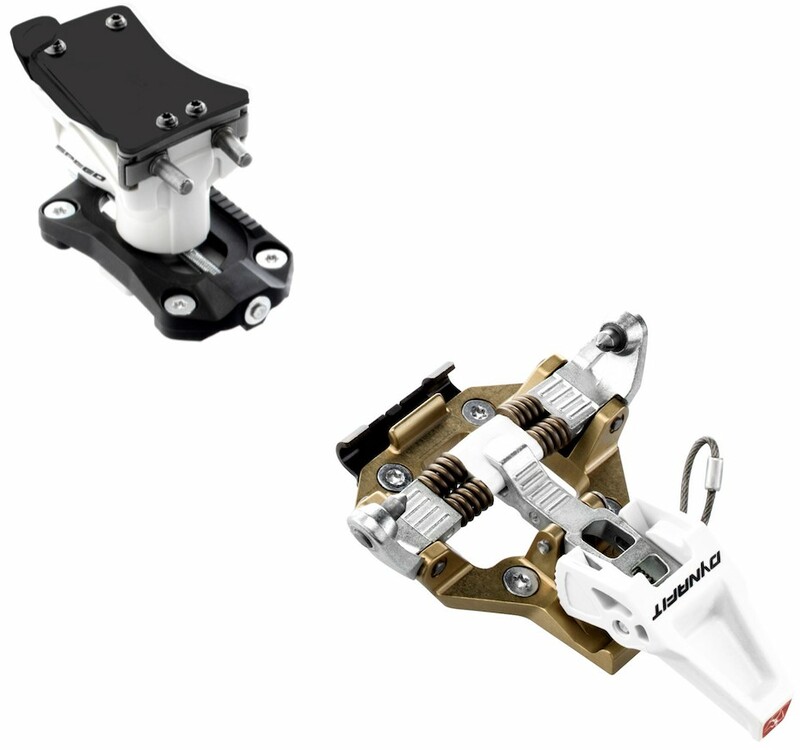 Fully adjustable heel pieces have a release value range from 4-10 on the Dynafit scale. New forged aluminum toe frame is a simplified design with a 4-hole drill pattern. Heel piece can be adjusted fore/aft +/- 12.5mm to fit three full sizes of boots. Simple rotational heel pieces have two riser positions plus flat-on-ski mode. Toe lever features both locked uphill and unlocked ski positions. Crampon attachments included that accept Dynafit and similar ‘pons. Hey Andrew! Yeah, there are a ton! Chances are good if you had to rotate the heel to access a new riser height, but it also had brakes, you were on the Vertical which is discontinued. If you had to spin the heel piece once and then spring loaded risers would flip into place, but it also had brakes, chances are good you had the original Radical ST/FT. There isn't really a direct equivalent of either of those bindings at the moment as the Radical series has been replaced with the Radical 2.0 and the Vertical has been discontinued. Fill out our binding finder to see if we can dial this search in a bit better. Just bought another pair for some new skis and noticed that the new version with the black top plate on the heelpiece differs from the older version with the silver top plate in two distinct ways. First off there's no add on nubbin but I think the total height is the same as the silver version with the nubbin. Secondly, the hole for your pole tip is significantly larger. This makes it work better with carbon poles, which often have a larger diameter tip. The older silver version was a tight fit with some poles but worked great with my BD traverse poles. The newer version is a tad harder to turn with my poles, but still workable. In short, if you have carbon poles go with the new version and if you have aluminum poles go with the older version with the silver top plate. Just one point, the lower Radical toe "pin height" on the Speed Turn 2.0 means this new Speed Turn won't work with my La Sportiva Spectre boots. Too much rocker in the boot toe, so heel of boot doesn't safely touch ski surface in heel flat walk mode. For now I am using a Vertical ST toe, with the Vertical nylon toe shim to get "pins" high enough for my Spectres. So if you want to use these Speed Turn 2.0s with Spectres, you will need B&D shims. I still think this is a classic, reliable binding, and heel towers are easy to turn with a ski pole, which helps at transitions..The binding works great with my Scarpa F-1s (new ones). Just wanted to point out that B&D ski crampon dId not fit the new binding! It fits the old model just fine. It's not a binding problem of course. The binding is great! Never had a pre-release and severally very timely releases. FYI with a little bit of strategic filing the crampon fits just fine. That's what B&D advised when I contacted them about this. They also said they'll do the filing for you if you note the binding when ordering. Great, simple, dependable binding. However, the interface between ski pole and heel piece to adjust riser height is horribly designed. If ur pole end is not perfect diameter or collects any ice, the margin to quickly transition is taken away and potentiates profuse profanity. B&D does sell heel plate and riser cones for $50-60ish. Hi Goatroper, the riser isn't specifically designed to be operated with a ski pole, but it can work with some models. Whiskey Tango Foxtrot, go go gadget arm. I guess these kind of "features" from an otherwise immaculate design, are what keep B&D in business. The "words" states that the BSL adjustment is 12.5mm, but the "specs" state that it is 25mm... Which is correct? I'm guessing that 12.5mm is the correct value. I'm debating between Speed Turn 2.0's and Speed Radicals, and probably leaning towards the Speed Radicals. I gather that the Speed Radicals have a BSL adjustment of 22mm, and if the Speed Turn's have 12.5mm or 25mm means they are either not worth considering for myself or a strong contender. Hey Colin, thanks for reaching out! The adjustment range is +/-12.5mm, totaling 25mm. The baseplate on the Speed Turn 2.0 and Speed Radical are the same except the Speed Radical has a rotation stop which limits the fore/aft adjustment by 3mm. They're both fantastic bindings, especially considering the price, so you can't really go wrong. It really just depends on if you want to spin the heel each time to access a new riser or spin it once and use a pole or your hand to flip risers. Ive loved the 3 pairs of these I have used (on powder skis, skinny skis, and all-rounders; 110 mm Rossi alpine skis are a little beyond what I would like to use these on everyday). The best of the classic vertical volcano (no blow up your binding the first day syndrome like some Radical heels), the 25mm adjustability expected from a modern rando binding, and now better colors and a 4 hole toe. I do slightly miss the "power" toe on the speed radical as these toes make cleaning binding fittings a little harder, but that is the only thing I've noticed. Get two pairs and make fun mismatched colors so you don't confuse skis with anyone else rocking these awesome bindings. I have these bindings, and am starting to be disenchanted with the insane ramp delta (~15 I think?). Any thoughts on what is the best option to bring that down? 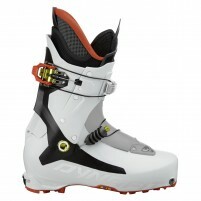 I very infrequently change boots (like never), so I am looking at mounting a different heel piece to my skis. Thanks, Skimo. Hey Robert, I agree it's a pretty aggressive delta at 16mm. The method of evening out the delta depends on what route you'd like to take. You can always put a B&D Shim underneath the toe to raise it up if you'd like to keep the heel piece. Otherwise if you're thinking of replacing it you may want to look at our list of Binding Pin Heights that we've compiled to explore some different options. Otherwise email me at help@skimo.co and we can talk more in-depth about it. Great value in a solid binding. I have put my absolute trust in these on some pretty terrifying lines and they have not let me down. Light enough for speed traverses, strong enough for the occasional resort lap, well priced and dead simple. Not to mention they do away with the flip risers which make Speed Rads so apt to lever their own top plates off. All I could ask for is a heel that turns easily with a pole in both directions and a stronger plastic pad atop the heel tower (mine broke very quickly). Surprised that no one has reviewed these (n)uber-classic bindings yet. They're basically a lesson in simplicity and functionality, with a slight penalty for weight. I'd give em a 4.5 star rating for the moderately heavy weight, but alas, they are not designed to be a race binding. So 5 stars it is. Burly, adjustable, and everything you could want for an everyday touring binding. I've even got em on 187 Hojis and they perform just fine for touring and the occasional on resort foray. While there is a slight learning curve to the turning of the heel piece with poles (for some), it is outweighed by the confidence-inspiring and stout heel when compared to the Radical - which has it's weaknesses. The Radical is great for quick riser adjustments on the skin track but it is prone to breakage in a trade-off for their ease. So the Speed Turn 2.0 wins IMO. The Turn 2.0 is really a great mix of price, strength, performance, and weight for everyday bc use. Thank you, Dynafit, for bringing this one (back and improved) to market. A winner on many fronts.